Everyone knows one of the keys to a good relationship is being able to have fun together. Throughout their wedding day, entertaining moments showcased Karen and Matt’s personalities. They tied the knot at Our Lady of Lourdes Church in Glassboro, New Jersey and celebrated their reception at the Crystal Tea Room in Philadelphia. With wedding day nerves, Matt accidentally said, “I, Karen” when starting his vows. Laughter spread throughout the church and nervousness turned into hilarity. After the mishap, Karen said this moment made everything so much better. The rest of the ceremony went off without a hitch. Family and friends watched this special couple come together as one. 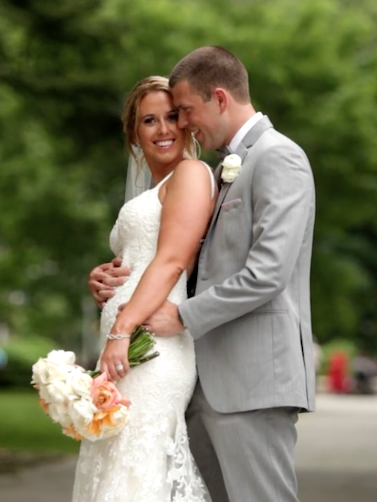 Our Allure Films team captured all of these wonderful wedding moments on video. Our partners at Philip Gabriel Photography took photos of the endless smiles throughout the day. We followed the wedding party to their reception venue at the Crystal Tea Room. This beautiful venue gave the couple a gorgeous space to continue their celebration. 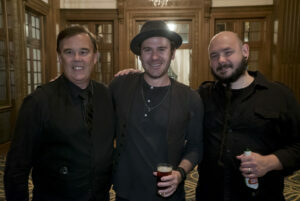 BVT Live’s Jellyroll Band kept the fun going with entertainment that kept everyone on the dance floor. It is always a privilege to film couples that are undeniably right for each other. The newlywed couple celebrated their day with so much laughter and love. Congratulations Karen and Matt! We wish you a lifetime of joyful moments. As we enter into the summer wedding season, it is important that we do not forget some of the beautiful weddings of couples who were married in the winter. Amy & Scott’s romantic winter wedding is definitely one for the books, and Allure Films had a blast capturing every second of it! The two were married in a traditional Catholic ceremony held at St. John the Evangelist before heading over to the reception that followed at Finley Catering’s Crystal Tea Room. Evantine Design created all the beautiful floral arrangements and décor seen throughout the ballroom, which perfectly complemented the stunning chandeliers and soaring ceilings. As our crew was filming throughout the day, Alison Conklin was also there to photograph all the incredible moments and scenery from beginning to end. EBE’s band Dreamtime had everyone busting a move on the dance floor, including the youngest members of the bridal party: the adorable flower girls and ring bearer. Aside from dancing the night away, everyone was treated to a delicious meal and touching speeches dedicated to the couple of the day. Amy & Scott, we wish both the absolute best and a lifetime of happiness together! Contact Allure Films to speak with a representative about our wedding videography packages. Everyone knows that your wedding day is one of the most memorable days of your life. We’d be willing to bet that the bride and her entire guest list will be talking about this big surprise for years to come! The groom wanted to surprise his bride at their Crystal Tea Room wedding. This stunning Philadelphia venue provided the perfect backdrop as they took the stage for their first dance, and the room filled with the sound of the acoustic version of You And Me. As the song began to play, the bride looked up in shock – there on the stage was her favorite band, Lifehouse, performing their hit song live right in front of her! We’re not sure what we loved more: the bride’s look of surprise, or the way the groom lovingly grinned at her sweet reaction. What a wonderful way to start a lifetime together! When the song ended, the talented musicians from the award-winning band were more than happy to pose for photos with the bride, groom, and even the Allure Films team. Congratulations to the happy couple, and thanks to the groom for letting us in on his little secret and allowing us to capture the touching moment on film! If you’ve ever dreamed of the perfect Philadelphia wedding, you’ve got to see this video from Tiffany & Matt’s big day! The couple shared a gorgeous wedding day at The Crystal Tea Room, located in the old Wanamaker Building in the heart of Philadelphia. With its stunning glass atrium, soaring ceilings, and massive crystal chandelier, the venue was truly a fabulous setting for such a romantic event. From the moment Tiffany & Matt shared their touching “first look”, we knew it would be a day filled with love and excitement. Surrounded by family, friends, and heartfelt words, the newlyweds celebrated with smiles on their faces the entire day. There were plenty of opportunities to catch all of the happy moments on film, with the stunning scenery of Center City Philadelphia providing an unbeatable backdrop. Best wishes to Tiffany & Matt! Thank you for allowing Allure Films to be a part of your special day! 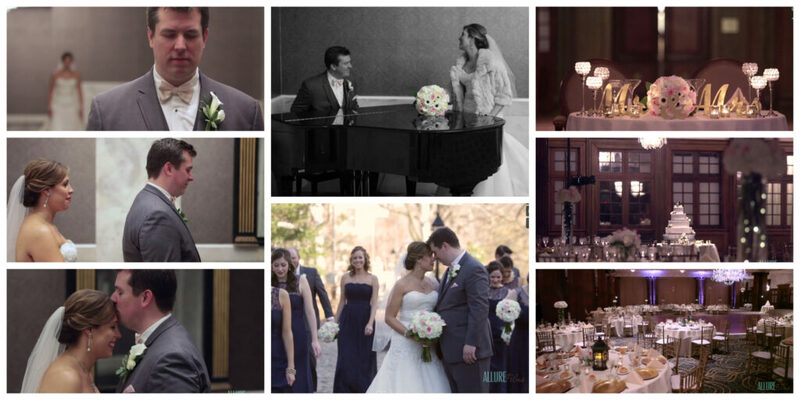 Click here to speak with a representative about Allure Films’ wedding videography packages.